Periodontal disease is a potentially serious dental condition that is generally noticed by your hygienist and diagnosed by your dentist. It is most commonly found during routine exams and cleanings. This is why it is important to make sure you keep all scheduled dental appointments. These checkups make it easier to detect problems before they have the chance to become major concerns. Your dental care team will check your teeth and gums and talk about any other symptoms you may be experiencing in order to make a diagnosis. So much of it comes down to taking care of teeth and gums day in and day out and when this is not done, problems may quickly set in. Your dental team can only do so much for you if you do not take care of your teeth and take responsibility for your routine care. Gingivitis is the official name given to the first stage of periodontal disease. When plaque and the accompanying bacterial secretions accumulate on the teeth and gum line, they inflame the gums. This makes them swollen, tender, and causes them to bleed easily. Plaque that forms on and around the teeth hardens and becomes what is commonly referred to as tartar. The gums begin to separate from the teeth, and infection sets into the gap. The gums may bleed easily, be swollen and tender, and some bone loss begins to occur. The teeth continue to be damaged by plaque and tartar and the gums separate from the teeth even more. Unless the condition is treated, the teeth will start to lose bone and will become very loose and can even begin to fall out. There can be significant bone loss at this advanced stage. Bone Loss – In the case of periodontitis, the bacteria gradually eats away at the underlying jawbone and at the periodontal ligaments that connect the tooth to the bone. A number of causes are believed to contribute to the onset of periodontal diseases including both genetic and environmental factors. In some cases, your chances of developing periodontitis are greatly reduced if you start taking preventative measures sooner rather than later. Knowing what causes periodontal disease can help us be more aware and watchful. Poor dental hygiene – The single biggest contributing factor to the development of periodontal disease is poor dental hygiene. If you do not take care of your teeth and gums with regular brushing and flossing and dental checkups, you are going to have problems. Taking care of teeth and gums must be a habit if you want to avoid periodontal disease and other problems. Tobacco use – Much research has been done that links the use of tobacco to many dental and oral health issues, including periodontal disease. Smoking and chewing tobacco not only increases your risk for oral cancer but can damage sensitive gums, erode teeth, cause bleeding, and make your teeth and gums more prone to infection. Genetic predisposition – Despite keeping up with proper oral hygiene routines and despite all the scheduled dental checkups, as much as 30% of the population will still have a good chance of developing periodontal disease. This is due to genetic tendencies that really cannot be helped- but you can work harder to reduce the severity if your genes are working against you. Pregnancy and menopause – Hormonal imbalances or sudden changes in the levels of certain hormones can make dental problems more severe. Many women experience issues with their oral health during pregnancy or once they hit menopause. Once the hormones balance out, the symptoms can lessen, but the damage may already be done. Chronic stress and poor diet – We all know that stress is harmful to the body but many people are surprised to learn stress can also negatively impact your oral health. Not eating right will also cause problems to develop and will make small issues into huge issues in no time at all. Being mindful of our daily habits can go a long way in guarding against periodontal issues. Underlying medical issues – Many medical conditions wreak havoc on the body. and this includes your teeth and gums. Diabetes and other blood-related diseases can make gums sensitive, cancer can damage bones, and some common illnesses and health conditions can cause problems with periodontal disease and overall oral health. Grinding teeth – Known as bruxism, teeth grinding is something that seems fairly innocent and more annoying than anything. However, it can cause major damage to your teeth and can make you more prone to gum issues down the road. Teeth clenching / grinding can wear down your teeth, stress the gums, cause TMJ pain, and jaw muscle soreness – all of which opens the door for more advanced issues. Medication – Many drugs such as anti-depressants, high blood pressure pills, anti-seizure medication, contraceptives, chemotherapy, steroids, and pain pills among many others affect the teeth and gums. In most cases, prolonged use of these medications can make you more susceptible to gum disease. Some weaken the teeth and gums and others encourage the growth of bacteria and slow bodily responses to infection. 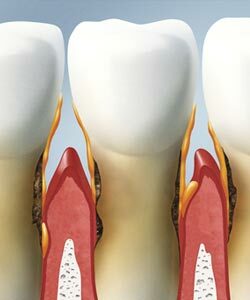 The treatment method for periodontal diseases depends on the kind of disease and how far the condition has progressed. Regardless of the treatment plan, good daily oral hygiene is essential for the success of any periodontal therapy. The first step is usually a thorough cleaning which may include scaling to remove plaque and tartar/calculus deposits beneath the gumline. The tooth roots may also be planed to smooth the root surface so that gum tissue may heal next to the teeth. In some cases, the occlusion (bite) may also require some adjustment. Antibiotics or irrigation with antimicrobials (agents or mouth rinses) may be recommended to help control the growth of subgingival bacteria which create toxins and cause periodontitis. Surgery may be required when deeper pockets (over 5 to 6 mm) are found. It is impossible for the dentist or hygienist to thoroughly remove all plaque and calculus from deep pockets. Patients can seldom keep them clean and free of plaque. Allowing pockets to remain may lead to infection and bone destruction. Some types of bone defects can be filled with bone grafts to help regenerate lost bone tissue. The best way to avoid problems that periodontal disease can cause is by taking care of teeth and gums every day. If you need help or have any questions about dental care, give us a call.